Of the over eighty exhibitions in the US Festival of India (1985-86) several focused on material as a pivotal and sometimes determinative element. Not just raw material but its transformation serves as a formative theme for the Festival, and with it by necessity several layered temporalities, from the time it takes to fire a clay pot to the recognition of many hands touching and remaking fabric recursively over time, to the non-teleological recycling of material into new forms. In each case the idea of transformation embodies within it a constant reminder of the stuff that came before, the material-that-was ever-present in the thing-that-is. These layered temporal transformations have limits, however—the exhibitions do not celebrate some sort of universal, apolitical, experiential encounter with temporality through these objects. The historical contingencies of the mid-1980s actively shape these shows—installations that unpack particular concerns about craft and materiality circulating both in South Asian art history and in contemporary Euro-American art. South Asia’s art and craft traditions interfaced here with the late Cold War’s diplomatic, economic, and political demands, both in the US and in India. Ethnographic and art museums challenged long-standing curatorial approaches, sometimes borrowing from one another and from performance-driven art forms. Popular culture images of India, from Indiana Jones to the rise of Nehru collars and block printed textiles in fashion circles inflected audience’s expectations when visiting these exhibitions. The Festival exhibitions that start from a material bring to the surface a range of intersecting, overlapping, and interrupting temporalities, the aggregate textures of which shore up, challenge, and are shaped by socially constructed relations of power and historically contingent limitations. To unpack these temporalities is to explore the workings of the exhibitionary social formation of the Festival in its mid-1980s context. In the year 1568, the Safavid ruler Shah Tahmasp (r. 1524-76) sent a delegation to the Ottoman sultan Selim II (r. 1566-74) at his court in Edirne with plentiful gifts of enormous value. The Safavids and the Ottomans were two of the most powerful Islamic empires at this time; the Safavids were based in Iran and the Ottomans were headquartered in Anatolia and the Balkans. The ceremony surrounding the presentation of these gifts, as well as the gifts’ precise contents and their symbolic and rhetorical significance for the Ottomans, the Safavids, and the other foreign ambassadors present at this encounter, constitute the central subject matter of this paper. This presentation of gifts was extraordinary, because among the objects brought to the Ottoman court by the Safavid ambassador was the world-famous illustrated manuscript, the Shahnama (Book of Kings) of Shah Tahmasp. My paper argues that the presentation of this incomparably valuable manuscript had dual purposes for the Safavid shah. On the one hand, it was designed to increase his chances of obtaining specific diplomatic concessions in his negotiations with the militarily and politically more powerful Ottoman sultan. But on the other hand, it was also intended as a public act of supreme generosity and magnanimity, which would solidify the shah’s own superior position as a patron of the arts vis-à-vis the Ottoman sultan. In the 1954 film Jagriti (Hindi: Awakening), a teacher takes his students on a train trip showing them the historic sites of the recently formed Indian nation. Surprisingly absent on this tour are Islamic monuments. A scene with a song, similar in lyrics, visuals, and narrative, enfolds in Bedari (Urdu: Awakening; 1957), a film from Pakistan that mimics Jagriti in its entirety and also ignores its shared Islamic past with India. Both films use music and train travel to each nation’s selected tourist landmarks as a way of manifesting patriotic, good citizenship. Touring heritage sites and consuming them through reproduced images creates shared cultural experiences, strengthening the ideological construct that binds people under a nation. At the foundation of this euphoric nation building in the 1950s, however, lay the massive displacement and communal violence of the Indo-Pak Partition in 1947 based on religious identities that divided the subcontinent into predominantly Hindu India and a mainly Muslim Pakistan. If there is one indelible act that symbolized the Partition, it was the mass movement of people and the exchange of movable property. It was through exchange that India and Pakistan acquired accouterments of nationhood such as citizens, land and a bureaucratic apparatus. At a time when trivial objects like furniture and something as vital as human life were considered exchangeable, the very object that had long been considered the repository of a nation’s identity – the historic monument – became an un-exchangeable asset. Through a comparison of Jagriti and Bedari, this paper asks that if the historic monument was so central to the formation of the nation’s identity then what are the implications of an Indian film that erases Islamic monuments from a tourist itinerary; and if Pakistan’s very identity depended on its being Islamic then why must its Mughal and pre-Mughal monuments associated with South Asian Islamic polities be absent? In this paper, I examine Istanbul’s Panorama 1453 History Museum, which visualizes the Ottoman conquest of the city. Unlike previous panoramic renditions by mostly European artists, the museum’s display, opened to the public in 2009, focuses on a single event in the history of Istanbul rather than the city’s topographic or urban peculiarities. From the early modern period through the nineteenth century, Istanbul as the site of a devastating Christian defeat has been the subject of numerous European artworks. The Ottoman conquest re-inscribed the city’s importance in the European psyche. Losing the city meant the loss of a tangible connection to Europe’s own cultural past, its own history, its own pre-modernity reflected in the multitude of Greek, Roman, and Byzantine ruins within the city. In contrast, the dissolution of the Ottoman Empire in the early twentieth century followed by the creation of the Turkish Republic led to an alienation of Istanbul’s Ottoman and Islamic heritage. The revival of this very heritage through a visual celebration of its genesis reaffirms a temporally distant political and religious victory in the rising Islamist context of the present. What is curious is the method of presentation—three-dimensional artifacts and painted scenes in a format reminiscent of nineteenth-century panoramas. This paper will consider the multifaceted implications of the panorama museum in its role as narrator of a contested history. Within a few short years after its founding in 1850, the Madras School of Arts became the first colonial art school on the subcontinent to request a photography instructor, much at the urging of its founder and first superintendent, Dr. Alexander Hunter. The request was fulfilled and government photographer Linnaeus Tripe came during the monsoon season to instruct the students on what was at the time the new technology of photography. From that time on, photography became integrated into the school’s function. At the same time, Hunter harboured a deep suspicion about the new technology. While acknowledging the speed and accuracy with which it captures detail, he called photographic images “feeble” and “dangerous” in comparison to drawings, which he considered a superior method of art education. This paper examines the early decades of the Madras School of Art’s history to sort out this tension and gain insight into the early history of photography in India, a period often dominated in the scholarly literature by amateur European photographers and government-sponsored photographic projects. This paper looks at 1) the history of photography at the Madras School of Art under Hunter’s leadership, 2) its relationship with pre-photographic representational practices and 3) the various ways the photographic images were used to produce knowledge about South Asian visual past. The primary purpose of this paper is to examine the discourse surrounding dome and minaret forms through a case study of the Ahmadiyya Muslim Jama’at (community) in order to expand the discussion of mosque architecture in Germany beyond Muslims of Turkish origin. Due in part to a change in citizenship law in 2000, Germany has experienced a marked increase in mosque building, as members of the Muslim diaspora assert their presence in and commitment to the host nation. For the Ahmadiyya, like most Muslims in Germany, mosques are much more than places for congregational prayer. They are community centers that provide space for fellowship, education, and interfaith dialog. Mosques are also very visible representations of the community’s place in the contemporary city, where domes and minarets are both desired and contested. In spite of a rich and complicated architectural history, the mosque’s most persistent symbols continue to be the dome and minaret, garnering attention from patrons, architects, worshippers, critics, and even legislators. Across Europe there has been controversy surrounding the increasing visibility of mosque architecture, and Germany is representative of these debates, which range from aesthetic concerns to unabashed xenophobia. This analysis of recent mosques built by the Ahmadiyya provides a case study that aims to clarify the practical, emotional, and symbolic role of the mosque and its formal elements, in order to understand their persistence. While innovation in mosque architecture is occurring, it is often focused on reinterpretations of dome and minaret forms, drawing both praise and criticism, and resulting in a discursive ambivalence about contemporary mosque design. Moving beyond issues of form and design, this paper attempts to explore the fullness of ways in which meaning may be conveyed and construed through dome and minaret forms, which activate not only the landscape, but also ritual practice and historical memory in the psychology of the worshipper. An important component of many mosque complexes built throughout the Ottoman Empire’s long history and extensive territory was the soup kitchen (imaret), where food was cooked and distributed to the poor and needy, as well as to the many employees working in and around the mosque, tomb, schools, caravanserai, hospital and so on. In fact, soup kitchens—their expenses were paid via charitable foundations whose administrators produced voluminous documentary evidence—became one of the signature institutions of the empire, promoting the ruling dynasty’s beneficence and imperial vision (and taste). The seventeenth-century Ottoman travel writer Evliya Çelebi, in his multi-volume Seyahatname (Book of Travels), wrote that on all his journeys, leading him as far as Vienna in the north and Upper Egypt in the south, he saw “nothing like our enviable institution [the imarets].” It is remarkable that in his descriptions of Ottoman mosque complexes that include an imaret, Evliya Çelebi routinely mentioned the building’s form and appearance (such as the loftiness of the mosque’s central dome) together with the food distributed, thereby creating a concrete link between the visual and the gustatory experience of architecture. Using this link as a springboard and based on an analysis of the architecture, archival documents and literary sources, I will explore the following: How was the form of imaret buildings shaped by their function as kitchens? What types of food were served in and therefore associated with imarets? How did contemporary Ottoman authors express these associations between taste and the built environment? And, most importantly, in which ways did architecture and food work together in order to create a multi-sensorial experience of the space in and around early-modern-period mosques in the service of Ottoman imperial and religious identity and vision? In answering these questions, this paper tries to unravel how states may use channels other than the verbal and visual to communicate values and messages to their subjects and how the sensual logic of an architectural monument may work. Using Ghari/Ghar Pe/At Home, a 2012 community-based art project initiated by a non-profit organization in Dharavi, Mumbai, as a case study, this talk proposes a rethinking of the critical paradigms of contemporary collaborative art through an analysis of the recent emergence of multiple, and often competing, exhibitionary networks in South Asia. These new constellations have engendered new networks of knowledge-production, new forms of praxis, and new strategies of display. Enmeshed within community-based civil society network models due to the involvement of non-government organizations with pedagogic and emancipatory aims, such art projects not only demarcate an emergent civic imagination but also intersect with larger histories of the struggle for social justice, citizenship, and democratic representation in India. This talk will be attentive to these intersections and alert to the questions that such entanglements between art and civic activism present for the broader critical frameworks of collaborative art. Simultaneously, mapping out the processes through which Ghar Pe evolved, the talk will foreground the modes through which certain kinds of knowledge about art seep into contexts marginal to its normative cultural networks and are, in turn, elaborated through subtle displacements that ultimately transgress the limits of the very field of contemporary art. As affective sites of social and pedagogic transformation, such projects engender a different knowledge-system, iterated through an ethics of locality and a tactic of globality from below. Such an iteration, I propose, is not incidental but constitutive of a politics of marginality in a globalized cultural field. The well-known 19th-century photographer, Deen Dayal (1844-1905), owed his success at Hyderabad at least partially to two men who acted as his champions to the sixth Nizam. One was the Nizam’s prime minister, Sir Asman Jah, and the other was his aide-de-camp, Major Afsur ud-Dowlah; both men were keen patrons of photography, and both had carefully crafted public personas. Focusing on Major Afsur ud-Dowlah in particular, this paper examines the noble’s sustained patronage of, and appearance in, Dayal’s photographs in order to analyze the role that photography played in the courtly culture of Hyderabad between the mid 1880s and early 1900s. Specifically, I argue that the Major’s relationship to photography was central to the charismatic identity he cultivated, and that identity, in turn, was central to his political success, both at the Islamicate court of Hyderabad and in the British Empire. His adept use of the medium and the success it engendered points to the ways in which photography was reshaping the visual construction of identity at the end of the 19th century. Moreover, as a subject that can be read as simultaneously fulfilling and subverting social expectations, Afsur ud-Dowlah forces us to rethink how categories such as race and religion have been constructed vis-à-vis modernity. The Amba Mata Temple in Udaipur was built by the Sisodia ruler Raj Singh (r. 1652-80) in 1664. Though architecturally the temple is rather plain and unspectacular, typical of the 17th century, the interior is notable for its rich and varied interior decoration, a result of continued imperial patronage from its inception to the present. Though much of my previous work has focused on Sisodia patronage of large architectural projects which, I have argued, were intended to make grand, political statements aimed at the Mughal dynasty and other Rajput houses, in my recent research I have been interested in exploring the less “monumental” buildings Sisodia rulers patronized, particularly those that seem to have been intended for the local population. At first, I thought that this small, unremarkable structure was nothing more than a simple gift to the masses from a dharmic king, rather than a statement of dynastic legitimacy; however, what I discovered is that this, too, was intended to serve as an apparatus of imperial authority – but this one was directed to the general, local populace rather than powerful competing ruling houses. In this paper I plan to (1) examine the diverse artistic program of the temple; (2) identify the significance of the temple within the broader context of Raj Singh’s extensive patronage; and (3) propose that, at its inception, the Amba Mata Temple was an integral part of a carefully-planned imperial temple scheme intended to support both dynastic legitimacy and Sisodia religious cosmology. This paper examines the architecture and ideas of colonial colleges in northern India. South Asian architecture of the colonial period has been examined in several studies, most notably the monographs and articles of G.H.R. Tillotson (1989), Thomas Metcalf (1989), and Philip Davies (1985). While recent studies on colonial architecture have expanded their focus to spatial relations and/or successive reinterpretations throughout history (Brown 2006; Chattopadhyay 2005), most studies on the 19th and 20th century architecture focus on the monuments and their architectural style and development, particularly the rise and adaptation of the Indo-Saracenic style. In this paper, I examine the architecture of four colleges established during the colonial period, in addition to their founding principles and courses of establishment. Through this study, I take on the question of an indigenous modernity, in that the agents of production emerge from South Asian academies to provide new lens towards the space of the postcolony. The rise of an educated middle class of ‘intellectuals’ in South Asia warrants much investigation, as they have played crucial roles in the Independence movement as well as the governmental and private sectors of post-Independence. However, rather than pursue a fragmented portrait of individuals, I aim to depict the historical, cultural, visual and epistemological conditions of their education. Although all graduates of each college cannot be considered a homogeneous group, several colleges exhibit strong religious or sectarian, professional dispositions from the time of establishment. For example, Rajkumar College (Rajkot, est. 1870) or Mayo College (Ajmer, est. 1875) were established by the British to educate the sons of native princes; Aligarh Muslim University (Aligarh, est. 1875 as Mohammedan Anglo-Oriental College) and Banaras Hindu University (Varanasi, est. 1910) were founded under certain religious principles. While the former colleges were geared towards breeding “loyalty and understanding of the empire and its attendant infrastructure”, the latter colleges were focused on establishing “religious education” in a modern environment. These differences in educational principles were reflected in the architecture of the buildings, which shifted through a use of Western or Indo-Saracenic architecture to a more nuanced representation of the modern nation. Nestled amidst a leafy, verdant landscape contiguous to the estuary of the river, Bou Reg Reg, next to the material remains which go back to the Roman occupation of the site during the 2nd century CE, the Marinid khalwā or the funerary precinct (c.14th century) in the fortifications of the Chella on the outskirts of Rabat in Morocco was marked as a dynastic necropolis by the first Marinid Sultān, Abū Yūsuf Yā’qūb (d.685/ 1286). It was soon endowed, among other structures, with a mosque, sepulchers housing the mortal remains of Marinid royalty, and a substantial madrasa. One way to hypothesize the presence of this madrasa in a dynastic funerary setting is to conjecture that the Marinids’ aligned themselves with the consecrated aura of the site, and appropriated its significations in the act of establishing their material presence on the site. Tentatively holding this conjecture, this paper focuses on the madrasa of the Marinid khalwā, and seeks to unravel the strands of its unusual presence in the Chella: the presence of an institution of learning in a dynastic necropolis. A fruitful way of examining this phenomenon is through taking into account the force of baraka (holy grace) conjured up in the context of the Chella and the khalwā: metaphorically, it is the earth of the Chella which archives exalted memories and knowledge, consequently justifying the presence of an institution of learning within its fold. Conversely, it is the embodiment of memories and knowledge in the architectural physicality of the madrasa and their resultant dissemination through such an institution of learning that could explain this peculiar architectural concurrence. To this end, the paper aims to map the dynamic of Marinid construction of authority through the premises of hallowed alliances with piety and knowledge, effectively expressed in their architectural preoccupations. In this study I examine recent art projects, on the banks of the Yamuna river, by two Delhi-based artists, Atul Bhalla and Asim Waqif. On the one hand I examine the manner in which Atul Bhalla strives to think the boundaries and limits of the river and its water, more permissibly. Through an examination of Chabeel, Bhalla’s 2008 installation near Kashmiri Gate in Delhi, I explore how the artist emphasizes the manner in which water comprises or constitutes the objects and bodies that lie beyond its own limits, as a bounded entity. On the other hand, I explore how Asim Waqif, in his project Help, [Yamuna’s] protest (2010–2011), demonstrates the manner in which urban thought in Delhi strives to go beyond its own bounds and limits, and constitutes the river in its own limiting terms and criteria. In my study, then, if I emphasize the differences in the way the two artists orient themselves towards the Yamuna river, I do so because I wish to explore the extent to which their projects can serve as conceptual resources. I explore their projects as conceptual resources to help one to appreciate the permissible or fluid nature, in Delhi, of the limits and boundaries of what constitutes the object of environmentalist discourse on the one hand, and the object of urban, mediatized thought on the other hand. Hands clasped at her chest, standing on a crescent moon, Our Lady of the Immaculate Conception stands before the devotee. She is immediately recognizable by the Catholic viewer. However, as one examines the figure more closely, Mary is not completely “western” in her appearance. Her garments are wrapped like a sari. Her eyes are almond-shaped. Her long hair falls straight, into a point down her back. These features suggest a South Asian influence. The Portuguese encounter with South Asia in the sixteenth to eighteenth centuries led to a coming together of Western and South Asian imagery in ivory statuettes created for the mission enterprise as well as for export. Indian artisans in Goa and Sri Lanka carved many of these works. Images of the Virgin Mary are prolific, represented by various figural types. The most common of these types is Our Lady of the Immaculate Conception and Our Lady with the Christ Child. What significance do these forms hold for the mission enterprise? What messages are they meant to express to the viewer? How do they represent the coming together of cultures in their forms? In this paper, I will address these questions, illustrating the complexity of the Virgin Mary’s iconography and how she becomes a South Asian form of the divine. Over the past two decades, critical histories have questioned the conceit of the archive-museum as a panoptical repository of documents and objects. While this turn in history-writing has engendered productive anthropologies of the archive-as-subject, the spatial topologies that make the archive has, however, received scant attention. My talk proposes that the turn to the archive-as-subject has to account for a spatial history of the archive as well. Reading Shangri La—the philanthropist Doris Duke’s museum of Islamic art in Hawai‘i—as an archive-museum produced through interplay between architectural arrangements and objects housed in that space, I suggest that the history of the archive is also a history of spatialities that delineates visibility as a form of public culture. By situating the museum within a history of twentieth-century displays of Islamic art in the West, I thus rethink the archive as a space of knowledge-production. While parts of Spain were ruled by Muslim leaders for over 700 years, since the Islamic period its place in Spanish culture has been contested. At times, the innovations introduced by Muslims were appreciated while at other moments Muslims were vilified. In twentieth-century Cordoba, the cycle of tension and acceptance continued and was manifested in interesting ways. Much of the twentieth century was dominated by Francisco Franco and his vision of a Catholic Spain. Surprisingly, although Islam was not officially recognized in Spain, it is in this period that a mosque, the first to be built in centuries, was constructed in Cordoba. Following Franco’s death, a new constitution was established and religious freedom guaranteed. In this new environment, one might expect an increased interest in Spain’s Islamic past and to an extent this did occur. However, at the same time, when confronted with a vastly changed political landscape as well as a growing Muslim community, an uneasiness with the Islamic past also emerged. At the Great Mosque of Cordoba, the question of allowing Islamic prayer became a source of tension. The control of other monuments, especially a derelict convent that had once been a mosque, sparked debate. Through an examination of three mosques in Cordoba and their twentieth-century histories, this paper examines the controversies and debates, and changing motivations that fueled them, as the political climate in Spain shifted drastically from the Franco era to the beginning of the twenty-first century. Held in conjunction with the College Art Association meetings, Chicago, IL. 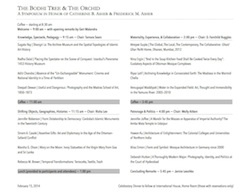 The Bodhi Tree and the Orchid symposium is held free-of-charge with the generous support of symposium participants and the University of Minnesota History of Art Department. 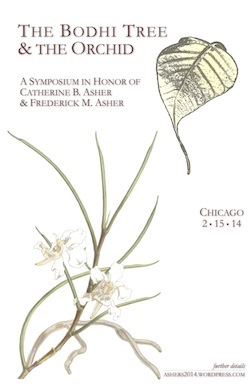 We thank the Department of Art History at the University of Chicago for hosting the symposium.